Away colours are a choice of coloured clothing used in team sports. They are required to be worn by one team during a game between teams that would otherwise wear the same colours as each other, or similar colours. This change prevents confusion for officials, players, and spectators. In most sports it is the visiting team that must change – second-choice kits are commonly known as away kits or change kits in British English, and road uniforms in American English. Some sports leagues mandate that away teams must always wear an alternative kit, while others simply state that the two teams' colours should not match. In some sports, conventionally the home team has changed its kit (such as in rugby union and early association football). In most cases, a team wears its away kit only when its primary kit would clash with the colours of the home team. However, sometimes teams wear away colours by choice, occasionally even in a home game. At some clubs, the away kit has become more popular than the home version. Replica home and away kits are usually available for fans to buy. Some clubs also produce third-choice kits or old-fashioned throwback uniforms. In American sports, road teams usually wear a change uniform regardless of a potential colour clash. Further, almost all road uniforms are white in American football (in the NFL and in NCAA football) and the National Hockey League, while in Major League Baseball, visitors typically wear grey. In the National Basketball Association, home uniforms are white or yellow, and visiting teams wear a darker colour. In the United States, "color vs. color" games (e.g., blue jerseys vs. red jerseys) are a rarity, having been discouraged in the era of black-and-white television. Most teams choose to wear their color jerseys at home, with the road team changing to white in most cases. White road uniforms gained prominence with the rise of television in the 1950s. A "white vs. color" game was easier to follow in black-and-white. According to Phil Hecken, "until the mid 1950′s, not only was color versus color common in the NFL, it was actually the norm". Even long after the advent of color television, the use of white jerseys has remained in almost every game. The NFL's current rules require that a team's home jerseys must be "either white or official team color" throughout the season, "and visiting clubs must wear the opposite". If a team insists on wearing its home uniforms on the road, the NFL Commissioner must judge on whether their uniforms are "of sufficient contrast" with those of their opponents. The road team might instead wear a third jersey, such as the Seattle Seahawks' "Wolf Grey" alternate. According to the Gridiron Uniform Database, the Cleveland Browns wore white for every home game of the 1955 season. The only times they wore brown was for games at Philadelphia and the New York Giants, when the Eagles and Giants chose to wear white. In 1964 the Baltimore Colts, Browns, Vikings and Rams wore white regularly for their home games according to Tim Brulia's research. The St. Louis Cardinals wore white for several of their home games, as well as the Dallas Cowboys. Until 1964 Dallas had worn blue at home, but it was not an official rule that teams should wear their colored jerseys at home. The use of white jerseys was instigated by general manager (GM) Tex Schramm, who wanted fans to see a variety of opponents' colors at home games. The Cowboys still wear white at home today. White has also been worn regularly at home by the Miami Dolphins, Washington Redskins, Philadelphia Eagles, and several other NFL teams. Teams in cities with hot climates often choose white jerseys at home during the first half of the season, because light colors absorb and retain less heat in sunlight – as such, the Dolphins, who stay white year-round, will typically use their colored jerseys for home night games. Every current NFL team has worn white at home at some time in its history. During the successful Joe Gibbs era, the Washington Redskins chose to wear white exclusively at home in the 1980s and 1990s, including the 1982 NFC Championship Game against Dallas. 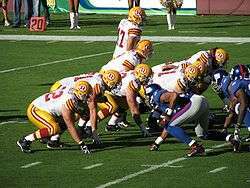 Since 2001 the Redskins have chosen to wear white jerseys and burgundy jerseys roughly equally in their home games, but they still wear white against the Cowboys. When Gibbs returned from 2004–07, they wore white at home exclusively. In 2007, they wore a white throwback jersey, something even the Cowboys have not done. The Cowboys' blue jersey has been popularly viewed to be "jinxed" because of defeats at Super Bowl V in 1971 (when they were forced to wear their blue jerseys as the designated 'home' team), and in the 1968 divisional playoffs at Cleveland, Don Meredith's final game as a Cowboys player. Dallas's only victory in a conference championship or Super Bowl wearing the blue jerseys was in the 1978 NFC Championship game at the Los Angeles Rams. Super Bowl rules later changed to allow the designated home team to pick their choice of jersey. White was chosen by the Cowboys (XIII, XXVII), the Redskins (XVII), the Pittsburgh Steelers (XL) and the Denver Broncos (50). The latter two teams normally wear colors at home, but Pittsburgh had worn white in three road playoff wins, while Denver cited its previous Super Bowl success in white jerseys (XXXIII), while being 0–4 when wearing orange in Super Bowls. 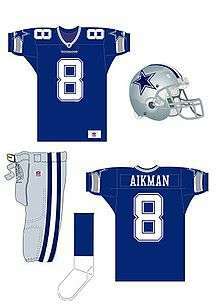 Occasionally, teams playing against Dallas at home wear their white jerseys to try to invoke the "curse", as when the Philadelphia Eagles hosted the Cowboys in the 1980 NFC Championship Game,. Teams including the St. Louis Cardinals and New York Giants followed suit in the 1980s, and the Carolina Panthers did so from 1995 until 2006, including two playoff games. The Houston Texans did so in 2002, beating Dallas in their inaugural regular season game. More recently, St. Louis and New England tried the same tactic. The originator of white home jerseys in the NFL at Dallas, Tex Schramm, said he did not believe in the curse. Starting in 2014, the Panthers, who like many teams typically switch from white to color in October or November, have worn white at home in the postseason regardless of their opponent. The franchise has never won a playoff game while wearing colored jerseys, including in Super Bowl 50, when the Broncos chose to wear white. White road uniforms were also used in the World Football League (WFL) during its short period of existence in 1974–75, and college football teams must base their road uniform around a white jersey. In England in 1890, the Football League, which had been formed two years earlier, ruled that no two member teams could register similar colours, so as to avoid clashes. This rule was later abandoned in favour of one stipulating that all teams must have a second set of shirts in a different colour available. Initially the home team was required to change colours in the event of a clash, but in 1921 the rule was amended to require the away team to change. In 1927 the Scottish Football Association decreed a different solution, whereby home teams wore white shorts and away teams black shorts, but this rule was rescinded in 1929. It is normal for individual competitions to specify that all outfield players on a team must wear the same colours, though the Law states only "The two teams must wear colours that distinguish them from each other and also the referee and the assistant referees". In the event of a colour clash, the away team must change to a different colour. Away kits were often worn by both teams in English FA Cup matches. Until 1989-90, its competition rules stated: "Where the colours of the two competing clubs are similar, both clubs must change unless alternative arrangements are mutually agreed by the competing clubs". Clubs sometimes needed to find makeshift third kits for their players. Many FA Cup finals were played under these rules, the last being the 1982 Final and replay. In European competition, the 1968 European Cup Final was played under similar rules. The old FA Cup rules, with almost identical wording, are still used in semis and finals by many county and district football associations in England. It is not unknown for teams to opt to wear their away colours even when not required to by a clash of colours. England sometimes play in red shirts even when not required, as the team wore red when it won the 1966 World Cup. Many professional clubs also have an official third kit, ostensibly to be used if both their first-choice and away colours are deemed too similar to those of an opponent. While a team's primary kit rarely undergoes major changes, the second colours tend to vary over time and sometimes by tournament. Some away kits are a modification of the home colours (for example a reversal of primary and secondary colours), other away kits are considerably different from home kits. Several club and national sides have favourite away colours which might remain the same more or less continuously. Often these are colours that were used in famous victories; for instance A.C. Milan (white) and Brazil (blue). In some title-deciding matches, a team has won the game wearing its away kit, but changed to home shirts for the trophy presentation – most notably when Spain won the 2010 World Cup final in their dark-blue away kit, but changed to red home shirts to lift the trophy. At international level, away kits are sometimes worn by both teams in a match. FIFA rules state, "In exceptional cases, both teams may be asked to wear different Colours" by the referee or match commissioner. This is most likely to happen in World Cup matches with large numbers of black-and-white television viewers, so that the teams' kits also differ in tone (light and dark). World Cup teams often have to make changes that would be unlikely in domestic or untelevised games. In 1957 Scotland borrowed home team Switzerland's white away shirts to avoid clashing on black-and-white television. Three teams have won the World Cup final in their away colours – in 1958 (Brazil), 1966 (England) and 2010 (Spain). In 1970 England and Czechoslovakia were allowed to play in sky blue and white, respectively, which caused confusion for black-and-white viewers and England manager Alf Ramsey. England reverted to red shirts against West Germany. Before the 2014 World Cup FIFA decreed that Spain's all-red and all-black kits were not sufficient, and forced the team to produce an all-white third kit. Croatia were allowed to wear red-and-white checked shirts, instead of blue, against Brazil, only after Croatia appealed FIFA's original decision. England were not allowed to wear red away shirts, and instead were made to wear white against Uruguay, due to an apparent clash with officials' uniforms. Originally, Major League Baseball teams were primarily distinguished by the colors of their stockings. In 1882, the National League assigned different stocking colors to the member clubs; the league also assigned jersey and cap colors, but by player position rather than by club. The Cincinnati Reds were known as the "Red Legs" and "Red Stockings" during the early 1900s. By the end of the 19th century, it became common for teams to wear white at home, and gray in road games. Some teams used road uniforms of solid dark blue or black. An early example of this is the Brooklyn Superbas, who started to use a blue pattern for their road uniforms in 1907. Both the home and away teams' uniforms also contained trim in the team colors. In 1916, on the New York Giants' road uniforms, purple lines gave their uniforms a tartan-like effect and another kind of road uniform was a solid dark blue or black material with white around this time. 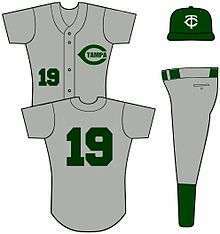 The Kansas City Athletics home and road uniforms were changed by Charles O. Finley in 1963, to the colors of gold and green. Some teams used light blue for their road uniforms from the 1970s to the early 1990s. Aside from the obvious need to distinguish one team from the other, conventional wisdom held that it was more difficult to properly launder uniforms while on a road trip, thus the "road grays" helped to hide accumulated soil. This convention continued well after its original premise was nullified by the issuance of multiple uniforms and the growth of the laundromat industry. Typically, home uniforms feature the team's nickname, while away uniforms feature the name of the team's geographic designation. Currently, the Tampa Bay Rays, Los Angeles Angels of Anaheim, Philadelphia Phillies, St. Louis Cardinals, and Milwaukee Brewers are the only exceptions to this rule, although the Brewers reintroduced "Milwaukee" on their alternate away uniforms in 2010. The Cardinals later on also introduced a cream colored alternate sporting the name "St. Louis." These teams feature the club nickname on both the home and away uniforms. The full word "Philadelphia" has never appeared on a Major League jersey in 165 seasons since 1900, including the Athletics' presence in the city from 1901 to 1954. In addition to this, some teams have featured mainly their team's location presented on their uniforms both at home and on the road. Examples include the Texas Rangers and Miami Marlins. Some teams have alternate home uniforms featuring location such as the Colorado Rockies and St. Louis Cardinals. From 1973 to 2008, the Baltimore Orioles were part of this group – the omission of the city's name being part of a largely successful effort to attract fans from the Washington, D.C. area – before returning "Baltimore" to the road jerseys in 2009, by which time their neighbor 38 miles (61 km) to the south once again had a team of its own. The rules of the National Basketball Association (NBA) state: "The home team shall wear light color jerseys, and the visitors dark jerseys unless otherwise approved. For neutral court games and doubleheaders, the second team named in the official schedule shall be regarded as the home team and shall wear the light colored jerseys". Most teams' home uniforms are white, with some exceptions, such as the Los Angeles Lakers, who wear yellow at home (although in 2002, to honor Chick Hearn, Jeanie Buss had a white jersey introduced as the third uniform, worn at home). But, according to this rule, road uniforms are required at every game in the NBA. "Dark" colors worn in road games vary widely between teams. The use of specially-designed Christmas uniforms in NBA games in 2012 led to several "color vs. color" matchups. In NCAA Division I college basketball, the home team almost universally wears white uniforms, while the visiting team wears colors. There are exceptions, such as the University of Michigan, which often wears yellow for home games if it sufficiently contrasts with the visiting team's uniforms. Away kits are a recent development in cricket, which has been played in all-white clothing for most of its history. The first professional match played in coloured clothing was in World Series Cricket in Australia in 1979. The first Cricket World Cup to use coloured kits was the 1992 tournament. The England team uses one kit for all home and away ODI and Twenty20 matches. India also uses a light blue kit for both. Australia, however, has a separate green ODI home kit, yellow ODI away kit, and black T20 kit. 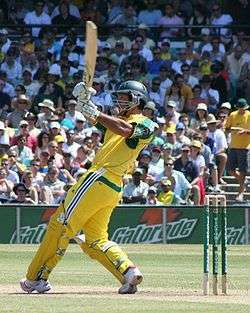 The home kit is the same colour as the famous "baggy green" cap traditionally worn by Australian Test cricketers, but the yellow away kit is often worn by the Australian team in home matches. In the NHL each team is currently required to have two uniform designs: one with a white base (or sometimes historically, a light colour), and one with a darker-coloured base. From the 1970–71 season to the 2002–03 season, NHL teams wore lighter colours or white at home and the darker colours on the road. When the Third Jersey Program was introduced in the 1995–96 season, some teams wore third jerseys at home, thus requiring the road team to wear the white. This problem was rectified at the start of the 2003–04 season, as NHL teams started to wear the dark colour at home and the white for road games; there are occasional single-game exceptions. The only element allowed by NHL rules to be interchangeable between the two uniforms is the pants. In the minor leagues, teams historically wore white or light colours at home and dark colours on the road. Away colours are used by Jamaica and Australia, two top international teams who both have yellow home kits. Jamaica's change kit is all-black, Australia's is all-green. When the teams meet, one usually changes its kits but there have been games such as a 2011 Test where each team wore predominantly yellow, with Jamaica in black skirts. Alternate colours are also used where required in the Australasian ANZ Championship. It is traditional in rugby (as it was in association football prior to 1921) for the home team to change in the event of a clash. This stems partly from teams touring overseas; it was easier for the home side to get an alternate kit. The World Rugby rules for tours do not state this outright: it is the responsibility of the WR CEO or representative "to resolve the matter", but "in the absence of any agreement to the contrary, the Host Union shall be entitled to wear its home kit." In English RFU level 3 to 5 competition, if there is a clash the away team must change. At Rugby World Cups, colour clashes are decided by a coin-toss for first choice of kits. In the 2007 quarter-final between France and New Zealand, the recently redesigned French kit was dark blue and black, and clashed with the All Blacks' kit. The toss went in favour of France, and New Zealand wore silver shirts in the game in Cardiff. However, in the 2011 Rugby World Cup Final between those teams, France won the toss and chose to play in its white away kit. France's team manager Jo Maso said this decision was because of "the welcome they’d received from the people of New Zealand, the faultless organisation of the tournament and the honour and pleasure of playing... [at] Eden Park". England used an all-black second kit at the 2011 World Cup, which caused controversy in the host nation, as black is the home colour of New Zealand. England wore the kit in one tournament match, against Argentina. Critics in England in 2010 said the team was changing away kits unnecessarily and too often as a "marketing ploy". Australia, on the other hand, has rarely worn an away kit except against Romania; a white jersey would have been worn in 2011. In international rugby, the need for second kits arises most often in the Six Nations, where Scotland, France and Italy all play in different shades of blue. The tournament takes the form of a single round-robin with home advantage alternating each year. This means that every year each team will play one home game in its alternate jersey. These have traditionally been white, but in the 2015 Six Nations Scotland and France adopted red as their alternate colour. Ireland's green jersey is complemented by two away jerseys, one white and one navy. 1 2 "Section 4: Equipment, Uniforms, Player Appearance" (PDF). National Football League. August 29, 2012. Retrieved January 5, 2016. ↑ "1955 Season - Week 1". The Gridiron Uniform Database. Retrieved 7 October 2016. ↑ "1955 Season - Week 8". The Gridiron Uniform Database. Retrieved 7 October 2016. ↑ "1955 Season - Week 10". The Gridiron Uniform Database. Retrieved 7 October 2016. 1 2 3 4 5 Brulia, Tim. "White at Home in the NFL". Uni Watch. Retrieved 12 June 2013. ↑ Eatman, Nick (November 26, 2013). "Cowboys To Wear Blue Jerseys At Home Thursday". Dallas Cowboys. Retrieved October 7, 2015. Since the days of former GM Tex Schramm, whose vision was to give the home fans a different look each week, the Cowboys have traditionally worn white at home. Schramm didn’t like the idea that fans would say the home blue jerseys vs. a white road team every Sunday, so Philadelphia's green or the Cardinals’ red or the Giants’ blue would mix up the color pattern on a weekly basis. ↑ Lukas, Paul. "The Island of Misfit Unis". ESPN. Retrieved November 28, 2007. ↑ Kaboly, Mark (October 28, 2009). "NFL teams turning back to white jerseys". Pittsburgh Tribune-Review. Retrieved 12 June 2013. ↑ Lukas, Paul (September 19, 2005). "What can white do for you?". ESPN. Retrieved 12 June 2013. ↑ Williams, Charean (November 22, 2001). "Cowboys going with retro look". Fort Worth Star-Telegram. ↑ Wallace, William (January 7, 1981). "Eagles Devise Color Scheme For Cowboys". The New York Times. ↑ "Visitors will be forced to cope with a case of the blues". The Boston Globe. ↑ "Cowboys to Wash Out Blue". The New York Times. January 15, 1981. 1 2 3 David Moor. "A Brief History of Football Kit Design in England and Scotland". HistoricalFootballKits.co.uk. Retrieved 14 January 2008. ↑ Cox, Richard; Dave Russell; Wray Vamplew (2002). Encyclopedia of British Football. Routledge. p. 74. ISBN 0-7146-5249-0. ↑ "Law 4 – The Players' Equipment". Laws of the Game 2008/2009 (PDF). FIFA. pp. 18–19. Retrieved 1 September 2008. ↑ "Standardised League Rules". Wessex Football League. Archived from the original on 6 March 2008. Retrieved 16 January 2008. ↑ "RULES OF THE LONDON FOOTBALL ASSOCIATION COUNTY CUP COMPETITIONS 2013-14". London Football Association. Retrieved 25 August 2013. "Heavy Woollen District Football Association 2010/11" (PDF). Retrieved August 25, 2013. "WEST RIDING COUNTY SENIOR CUP COMPETITION 2011/12". West Riding FA. Retrieved 25 August 2013. "WEST RIDING COUNTY FOOTBALL ASSOCIATION LTD Official Handbook Season 2009–2010" (PDF). West Riding FA. Retrieved 25 August 2013. "Prostar Cup rules". Barkston Ash District Football Association. Retrieved 25 August 2013. "Senior Challenge Cup Rules". Leeds Football Association. Retrieved 25 August 2013. "Uhlsport Hellenic League". Retrieved 25 August 2013. ↑ Glen Isherwood; et al. "England's Uniforms – Player Kits". England Football Online. Retrieved 23 January 2008. England sometimes choose to wear their red at home even though they could wear their white, as against Germany in the last match played at Wembley Stadium. The Football Association wished to invoke the spirit of 1966, when, in their finest moment at Wembley, England beat West Germany in the World Cup final wearing their red shirts. ↑ Ashdown, John (5 October 2011). "Which teams have had to wear their opponents' kit?". The Guardian. Retrieved 2 June 2014. ↑ Seal, Brian. "19 May 1957 – Scots In Swiss Clothing". Blogspot. This Day In Football History. Retrieved 2 June 2014. ↑ "Curious tales of World Cup shirts". FIFA. Retrieved 2 June 2014. ↑ Muller, Alex (27 May 2014). "Adidas Release Emergency Spain Third Shirt For World Cup 2014". World Soccer Talk. Retrieved 2 June 2014. ↑ Wright, Chris (28 May 2014). "FIFA Force Spain To Prepare 'Emergency' White Kit For World Cup Due To Baffling Holland Kit Clash Fear". Who Ate All The Pies. Retrieved 2 June 2014. ↑ "Croatia allowed to wear their famous checkered home shirt at the World Cup opener". Football-shirts.co.uk. Retrieved 2 June 2014. ↑ Lipton, Martin (May 9, 2014). "England forced to wear all-white kit throughout World Cup group stages after FIFA meeting in Zurich". Daily Mirror. Retrieved 7 July 2014. 1 2 3 "Baseball Uniforms of the 20th Century by Baseball Almanac". Baseball Almanac. Retrieved 2008-05-02. ↑ "Rule 3, Section VI—Uniforms (Players Jerseys)" (PDF). Official Rules of the National Basketball Association 2014–2015. National Basketball Association. December 9, 2014. Retrieved October 7, 2015. ↑ Ismail (September 20, 2009). "The Top NBA Road Uniforms: The Odd Numbers". Bleacher Report. Retrieved October 7, 2015. ↑ "NBA AND ADIDAS TO UNVEIL "BIG COLOR" UNIFORMS FOR CHRISTMAS DAY GAMES" (Press release). National Basketball Association. November 12, 2012. Retrieved October 7, 2015. ↑ Lukas, Paul (November 13, 2012). "Confirming What We Already Knew". Uni-Watch. Retrieved October 7, 2015. ↑ Phoenix Coyotes 2007-08 "Reverse Jersey Nights" Archived March 15, 2008, at the Wayback Machine. 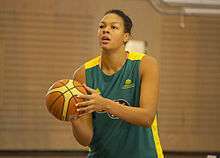 ↑ "Johannah Curran, Australia v Jamaica World". Zimbio.com. Retrieved 14 September 2014. 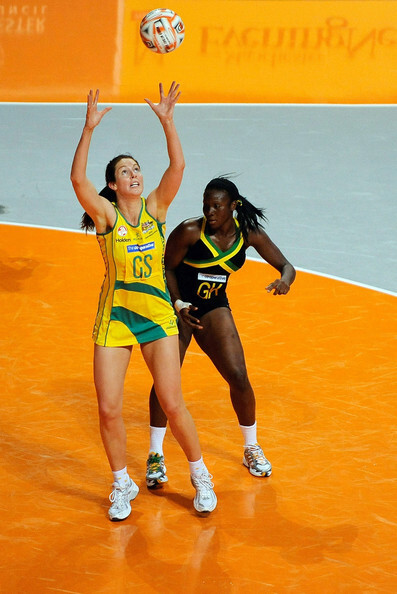 ↑ "2011 World Netball Series – Day One – Verity Simmons, Sasha Lynch". ISI Photos. Retrieved 14 September 2014. ↑ "Australia through to gold medal match against New Zealand, August 3, 2014". Netball.com.au. Retrieved 14 September 2014. ↑ "Australia v Jamaica Game One". Zimbio.com. Retrieved 14 September 2014. ↑ "IRB Handbook Online". Retrieved 3 June 2014. ↑ "RFU Regulation 13.6.3: Kit, Clash of colours". RFU.com. Rugby Football Union. Retrieved 3 June 2014. 1 2 "N. Zealand granted French leave for All Black final". Times of Malta. October 18, 2011. Retrieved 1 August 2013. ↑ "England v Australia: RFU defends use of grey away kit". The Daily Telegraph. 12 November 2010. Retrieved 3 June 2014. ↑ "Wallabies to be all white at the World Cup?". ESPNscrum. 5 May 2011. Retrieved 3 June 2014. ↑ Payten, Iain (5 May 2011). "Wallabies all white for World Cup". The Daily Telegraph (Australia). Retrieved 3 June 2014. ↑ "New Scotland alternate kit unveiled (24/09/14)". ScottishRugby.org. Scottish Rugby. Retrieved 23 June 2015. ↑ "France rugby team to wear red against Scotland". BBC Sport. February 5, 2015. Retrieved 23 June 2015. ↑ "International Rules - GAA - Shop By Team".